Butterflies of Massachusetts -- Celastrina "ladon"
Wing span: 7/8 - 1 3/8 inches (2.2 -3.5 cm). Identification: Seasonally variable and sexually dimorphic. Upperside of males blue, females with some black at outer edge of forewing. Late spring and summer forms with white above. Underside hindwing gray-white with faded small black dots, darker gray with larger black spots, or with blotches and black margins in the center. Life history: Males patrol and perch all day but are most active from midafternoon until dusk. Eggs are laid on flower buds. Caterpillars feed on flowers and fruits and are tended by ants. Chrysalids hibernate. Flight: Many broods from January-October along the Gulf Coast; progressively shorter flights northward; May-August in Canada. Caterpillar hosts: Flowers of a variety of woody shrubs and occasionally herbs including dogwood (Cornus florida), New Jersey tea (Ceanothus americana), meadowsweet (Spiraea salicifolia), and Collinsia. Adult food: Flower nectar from dogbane, privet, New Jersey tea, blackberry, common milkweed, and many others. Habitat: Openings and edges of deciduous woods, old fields, wooded freshwater marshes and swamps. Range: Alaska and Canada south of the tundra through most of the United States except the Texas coast, southern plains, and peninsular Florida; south in the mountains to Columbia. Conservation: This species comprises a complex of 4-5 separate species, some of which may be of conservation concern. 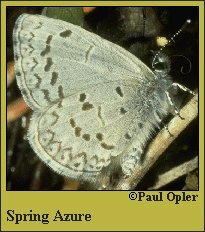 Note: In addition to the Appalachian Azure, Atlantic Holly Azure, Dusky Azure, and Hops Azure, this "species" is in reality still a complex of additional species whose identity is under current research. At present it is not possible to separate all of the records for these species into individual species maps. We look forward to doing this in the future.